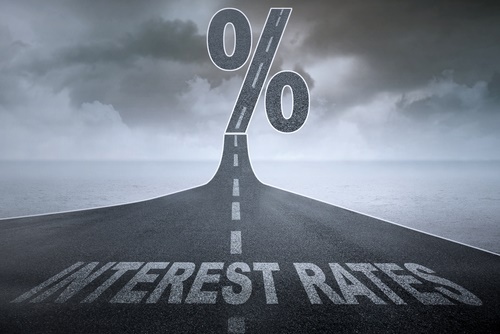 Two factors must eventually drag our short-term interest rates higher over the next 12 to 18 months, as I will outline. Long term interest rates (market determined) are increasing well ahead of static short-term interest rates (RBNZ determined). Increasing US long-term Treasury yields are pulling our three-years plus interest rate yields higher. US interest rates are increasing due to larger budget deficits, higher inflation and investor/borrower reaction to the increases. Here in NZ, at some point, investor demand shifts from short-term placement of funds to a longer term. The weight of money that has held short-term interest rates down for so long shifts away. The behaviour of borrowers is also important. Corporate and household borrowers who have ridden their luck with floating interest rates for many years will soon realise that global deflation has come to an end and their risk profile has changed i.e. much less probability of rates decreasing and a higher probability of rates rising. As discussed in recent weeks in this column, there is the potential double-whammy increase in our long-term rates over coming months with the outright yield following the US up, plus the NZ margin over US bond (just 13 basis points today) moving sharply higher as well. It will only take one Chinese sovereign wealth fund to sell their NZ bonds into a small illiquid local bond market to cause a sudden increase in the bond margin over the US. These will determine when the RBNZ are forced to signal a change in their monetary policy settings. The lower than expected December quarter CPI result has only temporarily postponed inflation increases in 2018 in my view. One-off price discounting by retailers caused that lower than forecast result, however if retailers have now all cleared their old stock that price discounting will not repeat. Last week’s survey of inflationary expectations was higher than anticipated and the RBNZ are again placing emphasis on this forward-looking indicator. Clearly, it is not only myself who is expecting rising inflation this year! Survey respondents are reacting to higher commodity prices, increasing rents, continuing increases in construction costs, increasing labour costs and volatile food prices (due to climatic conditions) as just some of the influencing factors. If inflationary expectations continue to increase over coming months, the RBNZ would be unwise to sit on their hands and wait for actual inflation to increase before changing their tune. On top of that, incoming Governor, Adrian Orr is much more likely to be a “pre-emptive” advocate with monetary policy signalling/nuances than his two predecessors were. The only unanswered question in this forward-looking analysis is the actual timing of action from the RBNZ and local borrowers/investors. The banks have moved their OCR first increase timing to mid-2019 to be consistent with the RBNZ. It does not take much to shift the sentiment. Interest rates up, house prices down. and it seems you dont wish to notice other sectors of the economy that were/are struggling. Really the OCR is a hammer trying to crack some specific egg shells without smashing some others. Oh and even at 5% if the speculators are seeing 20%+ per annum gains and fully intend to be in and out fast whether it is 2% or 5% really doesnt matter. Then there are the foreign buyers looking t hide their $s. Oh wait, I guess I see you are totally happy to kill our economy, businesses, jobs and probably send us into the worst economic recession since the Great Depression and cause decades of misery for younger people. I think you are the one sitting firmly in the tin-hat brigade if you think an OCR induced market crash is the best option. Recessions eventually happen - very true. They are an integral part of the business cycle. Like anything, long term risk is targeted. Put simply, the goal is not to avoid them, but reduce long term volatility of the business and financial cycles. That is a goal that is not conducive with your approach. Yes, so true. Thanks for imparting your unique economic wisdom. I forgot about all those investors who chase high volatility in the medium to long run. So, so many investors. ... the long term goal ought to be to build a diverse and robust economy , strong enough to weather the rough sledding when times inevitably go through a tough patch .. But yet you advocate for volatility? Forgive me if I'm wrong...But isn't that the antithesis of what you want for diverse and robust economic production? My dear Gummy, surely you are not expecting Civil Serpents to do sensible things? I mean, practising believing in impossible things is all well and good, but a belief in the wonders of a Centrally Planned Economy is going a bit too far, don't you think? Gummy, at the same time as raising the OCR, the RBNZ were 'talking' the currency down, actively intervening, bemoaning the ills of a strong currency .The RBNZ simply became upset that the market did not agree, and that New Zealand would have to back track like Sweden. The RBNZ should learn how to front run , arguing that you want all the cake after the event shows ineptitude. He's just been too early with interest rates and inflation. Although this is the environment where interest rates will move. Inflation is a separate issue as the US may start getting more inflation but it's too difficult to be sure if it's going to be significantly different from what they have now. Yes being early by 8 years is still wrong. It is so easy to make flippant unjustified comments. At this stage Roger has made comments which he has justified; I don't see the same from you. So no hand up from me. Type Roger search inflation ,search interest rates 2010-2018. Roger could give simple tabled forecasts 3;6;12;24 months. TWI, USD/NZD,AUD/NZD, OCR and CPI. Ah ... " too big to fail " ... now when and where have we heard those fateful words before ! Actually its based on evidence/proof ie 8 years or Roger's lack of successfully predicting inflation in here month in month out. Roger can indeed show some "logic" but if he chooses to ignore critical parts of the equation he will continue to be, wrong. PS I dont necessarily disagree on Interest rates not going up for a short term). In fact I think its quite possible the US Reserve bank will shoot itself in the foot (if its lucky, might be a head shot) and raise rates and the US and world economy will again fall back into stagnation and not a recession, if we are lucky. yeah long over him being wrong on inflation, and wrong, and wrong, and wrong...........again and again. Only for those in Debt. will interest rates hurt. A hell of a lot of em....interest only. I mostly agree, but there are folow ons / consquences/ ie if however you are a struggling [small] business and find you debt re-payments become un-manageable then its time to quit and then that's job losses. I'm sticking with my own theory, one morning I get out of bed, turn Al Jazeera on, and the world's changed for good for the next decade or so.